What a surprise to hear about this expensive Yubari fruit. It is very common is US and quite cheaply sold. I first tasted them when I was staying at the boarding school and the cafeteria served this sweet fruit daily which I loved too. 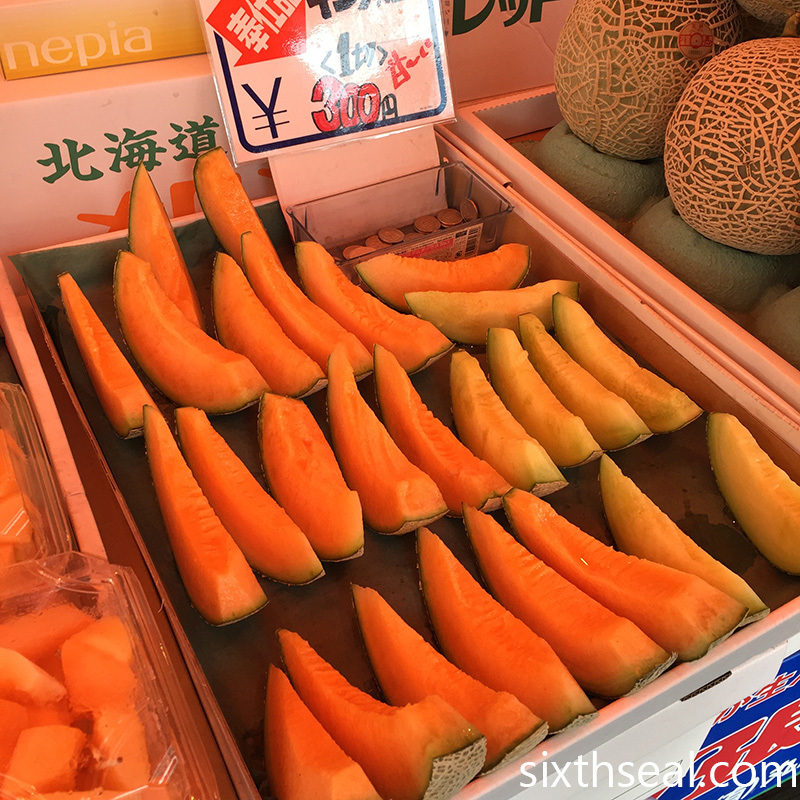 This Cantaloupe fruit was new to me too and now they are also easily found in our local grocery supermarkets. I am not sure where they are imported from. 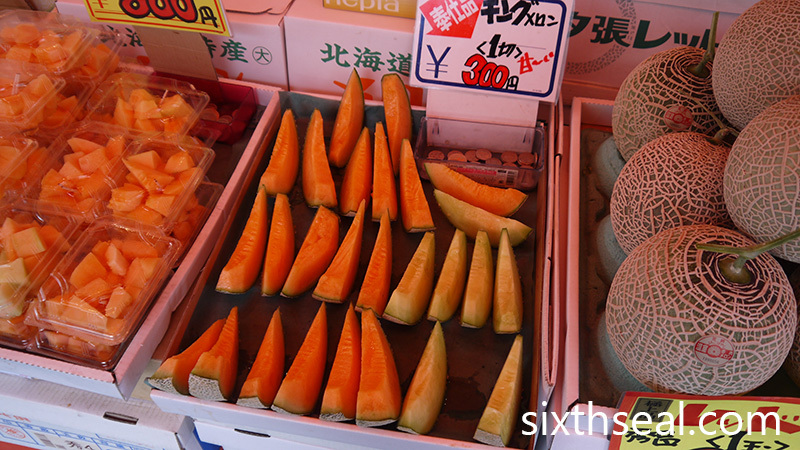 Now I am not sure whether Yubari and Cantaloupe are the same fruits. 1. A cross between Earl’s Favourite and Burpee’s “Spicy” Cantaloupe. I guess it’s also like how there are many mangos out there but the Harumanis (Harum Manis) mango from Perlis is RM 35/kg. This is the special Yubari King melon from Yubari in Hokkaido that’s a specific cultivar so it’s expensive too. Wow. This is so expensive. I will be lost in Japan because I cannot read the words. However, there are apps that can do Japanese to English translation (and backwards) nowadays. We used Google Translate app in Hokkaido – you just need to take a photo of the words and it’ll translate automatically to English. You can also write in English and it’ll show the Japanese words (very useful for communicating – on the last day, we needed an empty box and that’s how I asked for it and also Scotch tape from the people at the supermarket). BTW, the words here are キングメロン or (Yubari) kingu meron. It looks like the rock melons in Central Market, though. I wonder if the yubari and rock melons are related? I hear the Ganyao durians from Nonthaburi, Thailand are equally pampered too. They cost RM 1,200 each and have their own hats too. Haha. Oh, rock melons are cantaloupes – they’re a specific cultivar of cantaloupe grown in Hokkaido and it’s a product of two famous US breeds. 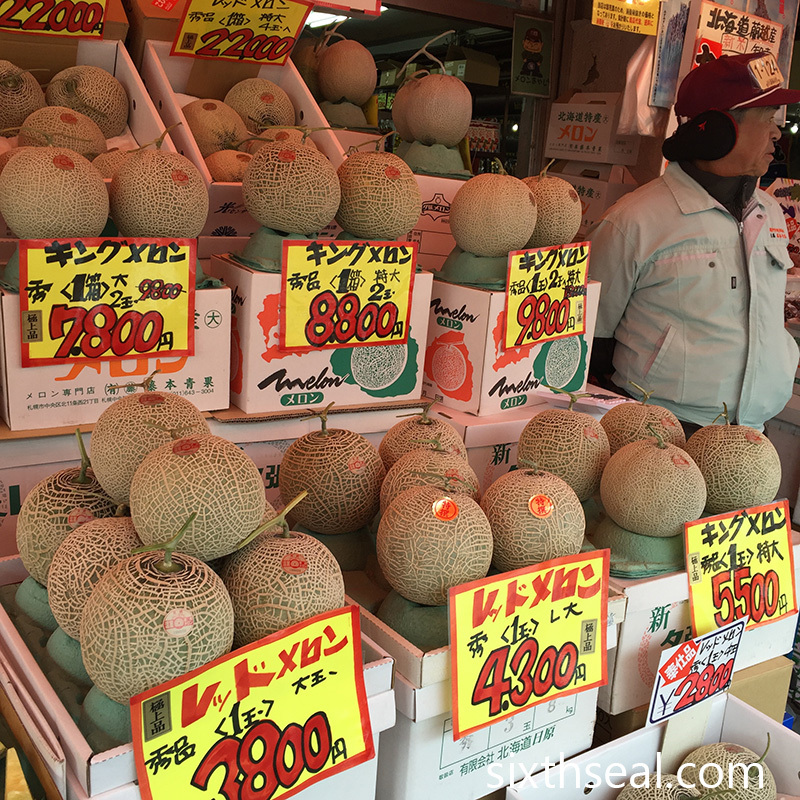 Yubari King is a netted-skin muskmelon that’s the sweetest I’ve ever tasted. 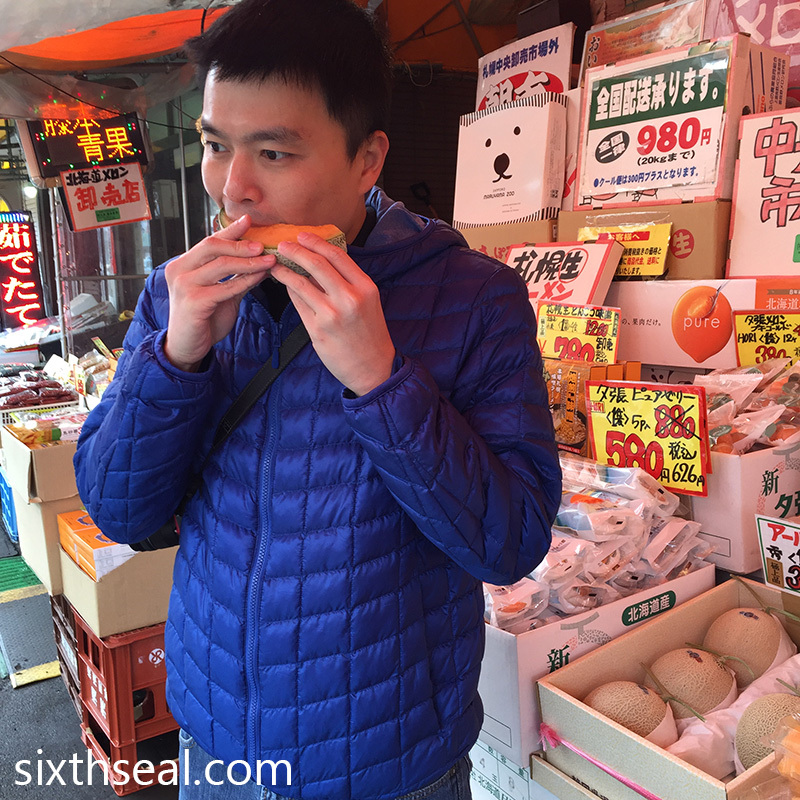 It’s very soft and juicy compared to a honeydew too (which is a smooth-skinned variety). I think the difference is in the breed, kinda like how D24 durians and Musang King durians are different – the latter is a lot tastier and has superior flesh and smell characteristics. 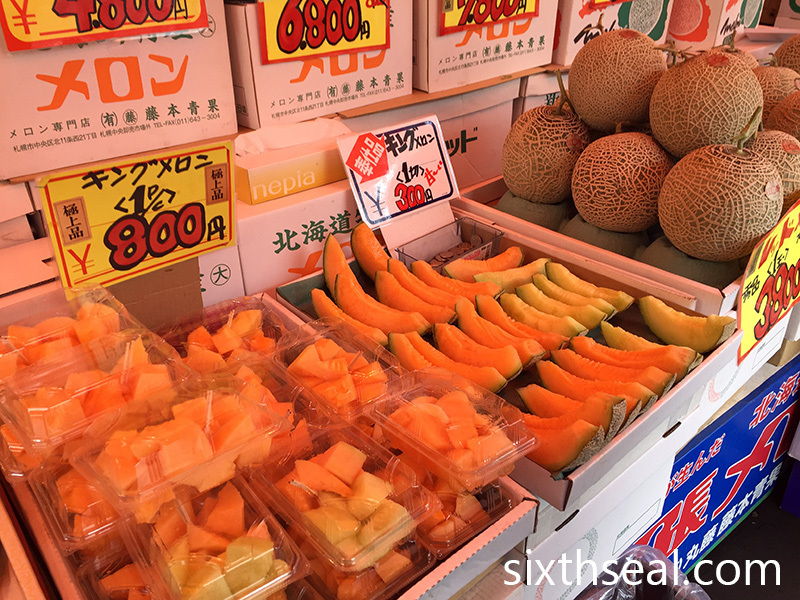 Yeah , these melons can cost you a fortune ! I only tasted yubari melon ice cream so far , and it’s not cheap. Cost me almost S$8 for a wafer cup. I got read about this expensive melon before. I would never be willing to pay 900 for one melon!! How it taste like? Nice? Not really into fruits, I’d stick to our local bananas and papayas most of the time. So boring hor, me!!! LOL!!! RM80,000 for a fruit is expensive! But RM13 for a slice, I will try it since I’m there already.. But if here, if you ask me to pay RM13 at the fruit stall outside the food court, errr, gotta think twice, haha.. The melon looks very very sweet, would like to taste it too.. This is a must try if we are there. Must taste the natural sweetness. The fruit looks similar to honeydew..it’s a must try fruit if got the chance.